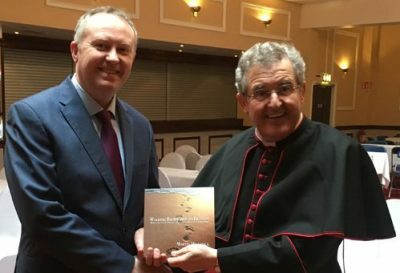 Author Martin Millerick (left) presents Bishop William Crean of Cloyne with a copy of his new book about the Catholics of Cloyne. A new book giving insights into how the Catholics of Cloyne retained their identities during the penal law era has been published. Walking Backwards to Heaven? Hope and the Catholics of Cloyne Diocese, 1700-1830, by Martin Millerick, was launched last Saturday at a conference about St Colman’s Cathedral in Cobh. This book outlines the struggles of Cloyne’s Catholics in asserting their identities in the harsh environment of the penal laws, which began to take effect from 1607 onwards when Catholics were barred from holding public office. Coincidentally, this was the time when the Tridentine Mass, known to many today as the traditional Latin Mass, began to be adopted. One of the first parts of the country to adopt this Roman Rite Mass was the Diocese of Cloyne. According to Mr Millerick, Thomas Davis from Mallow, and other nationalist leaders, believed that during this time the most Irish peasants could hope for was to agitate for something better and, after death, in God. Mr Millerick’s book explores how Cloyne’s Catholics found hope within themselves, their heritage, spirituality, culture and community. Notably, argues the author, the ability to emigrate to the New World played a major role in giving the native Irish hope, as well as confidence to remain true to their Catholic identity. The book, priced at €15, is available in St Colman’s Cathedral Bookshop in Cobh or from the Cloyne Diocesan Office.